Evangelectionary, Bruce Laverman, Evangelism Connections, 2016. "Breath, Touch, Sight and Faith," D Mark Davis, Left Behind and Loving It, 2013. The Lectionary Lab, Easter 2, the Rev'ds Dr. John Fairless and Delmer Chilton (aka "Two Bubbas and a Bible"), 2013. Lectionary Lab Live podcast. Process and Faith Lectionary Commentary, Easter 2, Bruce G. Epperly, "...bringing process-relational thought to people of faith." Girardian Reflections on the Lectionary, Easter 2, by Paul Nuechterlein & Friends. Jesus Now, Easter 2C. Lectionary, study and worship resources from Faith Futures Jesus Then & Now. "Octave of Easter" / Low Sunday, Wikipedia. "Low Sunday," The Catholic Encyclopedia, New Advent. "Low Sunday," Ronald Knox, The Epistles and the Gospel. "Blessed Doubt," David Lose, ...in the meantime, 2016. "Resurrection is Relationship," Kaaroline Lewis, Dear Working Preacher, 2016. "The Witness of Life," John W. Martens, America: The National Catholic Review, 2016. Sacredise Worship Resources, John vandeLaar 2016. The Politics of Reconciliation, Mark Davis, Political Theology Today, 2016. "Lighten Up and Let Loose the Praise," Sharron R. Blezard, Stewardship of Life, 2016. "Schooled in faith at the wounded hands of Christ," Robert Warren, Prospect, 2016. "Doubt: The Demon and the Angel of Easter," Nancy Rockwell, The Bite in the Apple, 2016. "Touching Faith," Melissa Bane Sevier, 2016. 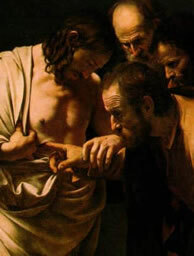 "Doubting Thomas...Or Not!" Marshall A. Jolly, Modern Metanoia, 2016. "Beyond Belief," David F. Sellery, 2016. "Stop doubting anad start believing. Stop fearing start sharing peace," Peter Lockhard, A Different Heresy, 2016. "Easter Commission," Robert Cornwall, Ponderings on a Faith Journey, 2016. "A Rejected Stone?" John C. Holbert, Opening the Old Testament, 2016. "Divine Wound," Suzanne Guthrie, Soulwork toward Sunday: At the Edge of the Enclosure, 2016. "The Disciple of Doubt," Dan Clendenin, Journey with Jesus, 2016. "Seeing and Believing," Eric Smith, LECTiO, 2016. "Belief and Doubt and Forgiveness of Sins," Janet H. Hunt, 2016. "Act and Believe," Sermon Stories, 2016. "Blessed Are You Who Have Not Seen," Glenn Monson, Law and Gospel Everywhere, 2016. "Thomas and the Bubonic Plague," Lynn Miller, celebrating our creative and living God by generating art and architecture resources for congregations and individuals. Art and Faith Matters facebook page contains additional resources. "What Thomas Wants," Andrew King, A Poetic Kind of Place, 2016. "Paving the Path - And Doubting Thomas Shows the Way!" Anna Shirey, The Labyrinth Way, 2016. "Why Our Bodies Matter," Greg Carey, ON Scripture, Odyssey Networks, 2013. "Remembering Rosa Parks: The Radical Faith of a Rebel Christian," Easter 2, Daniel B. Clendenin, The Journey with Jesus: Notes to Myself, Journey with Jesus Foundation, 2013. 2010 reflection. 2007 reflection. "Open the Door" Beth Scibienski, A Thousand Words of Inspiration, 2013. "Order of St. Thomas," Michael Coffey, 2013. "Show Me," Rev. Anne S. Howard, A Word in Time, The Beatitudes Society, 2013. "Easter for Doubters: The Unexpected Faith of Thomas," David R Henson, Edges of Faith, 2013. "The Never-Ending Story," David Lose, Dear Working Preacher, 2013. "Locked In And Locked Out," Alyce M. McKenzie, Edgy Exegesis, 2013. "That You May Believe," Thomas Beam, 2013. "Doubt, Belief, and Life in Jesus' Name," Sharron R. Blezard, Stewardship of Life, 2013. "Oh Hopscotch and Crocuses and Doubting Thomas Once More," the Rev. Dr. Janet H. Hunt, Dancing with the Word, 2013. "Can't figure out how to keep Jesus from showing up," Bob Stuhlmann, Stories from a Priestly Life, 2013. "Faithful Witness," Bob Cornwall, Ponderings on a Faith Journey, 2013. "Recognizing and Commissioning," Christopher Burkett, Preacher Rhetorica, 2013. "Thoughts on the Day After Easter," Bruce Maples, 2013. "The Gift of Music," Steve Goodier, Life Support Systems, 2013. "It's Not about Thomas," David Lose, WorkingPreacher.org. "Speaking Out," Mark Ryan, The Ekklesia Project, 2010. "Seeing is Believing," Melissa Band Sevier, Contemplative Viewfinder, 2010. "The Importance of Being Uncertain," Peter Woods, I Am Listening, 2010. "We Are Witnesses," Paul Bellan-Boyer, City Called Heaven, 2010. Dylan's Lectionary Blog, Easter 2, 2007. Biblical Scholar Sarah Dylan Breuer looks at readings for the coming Sunday in the lectionary of the Episcopal Church. "Believing Is Seeing," Peter Marty, Day 1, 2016. "Thomas Was an ISTJ," by Amy Butler. A Sermon for Every Sunday. Video sermons from America's best preacher for every Sunday of the Liturgical Year. "My Lord and My God," Anthony Clavier, Sermons that Work, 2016. "The Seeing Heart," Frederick Buechner, Buechner Blog. "Opening Day," the Rev. Matthew Gaventa, Day 1, 2013. "Exchanging the Peace," the Very Rev. Anthony F.M. Clavier, Sermons that Work, Episcopal Digital Network, 2013. 2 Pascua (C), el Rvdo. Isaias A. Rodriguez, Sermones que Iluminan, 2013. "Trust Jesus and Elvis," the Rev. Susan Sparks, Day 1, 2010. "Be Like Thomas," Faith Element. Podcast. "The Value and Limits of Religious Liberty," (Acts 5) Matthew L. Skinner, ON Scripture. With video and discussion questions. "Resurrection Witness," Weekly Seeds, UCC, 2016. Bible Study, Easter 2, 2013, Alan Cowart, Virginia Theological Seminary, Sermons that Work, Episcopal Digital Network. Ruach Words: Fresh Language for Worship, 2016. Worship Resources, Easter 2, Rev. Mindi, Rev-o-lution, 2016. LCA Worship Planning Page, Easter 2C, "Everything lay-readers need to prepare worship." Lectionary Liturgies, Easter 2C, Thom M. Shuman, Presbyterian Church (U.S.A.). Mustard Seeds, "Love in Spite of the Shadow of a Doubt," Easter 2, 2013. A lectionary-based ideas resource for leaders of contemporary worship, Ann Scull, Gippsland, Australia. Worship and Liturgy Resources, Easter 2, by Rev David Beswick, Uniting Church in Australia. Lector's Notes, Easter 2, Gregory Warnusz, Saint Jerome Parish, Bellefontaine Neighbors, MO. Notes and commentary for those reading this week's lectionary texts to the congregation. Prayer for Easter 2, RevAbi, RevGalBlogPals, 2010. The Timeless Psalms: Psalm 118:14-29, Easter 2C, Joan Stott, prayers and meditations based on lectionary Psalms, 2013. "The Loving Hands of God," Worship Ways, UCC, 2013. Commentary on the collect for Easter 2, Bosco Peters, Liturgy, 2016. HermanoLeón Clipart, Easter 2. Free clipart, backgrounds, slides, etc. Clip Art Images: John 20:19-31, John 20:19-31, Misioneros Del Sagrado Corazón en el Perú. "Praise 101," faithelement, various mulitimedia approaches to this week's scripture texts. Jesus' appearance to the disciples and to Thomas, audio telling, story in episodes, graphic, audio and written commentaries. Go Tell Communications, Biblical Storytelling for the Global Village, 2010. "When Thomas Heard from Jesus," Carolyn Winfrey Gillette's hymn celebrating the all of the biblical stories about Thomas, his growing faith and ours. Tune: AURELIA 7.6.7.6 D ("The Church's One Foundation"). "Your Word is Like a Lamp, O Lord," Carolyn Winfrey Gillette's hymn giving thanks for the Bible, including the stories of Jesus, and how it continues to speak today. Tune: 8.8.8 ("Lord, Speak to Me, That I May Speak"). "O God, In Raising Jesus," Carolyn Winfrey Gillette's hymn celebrating Jesus' resurrection leading followers to work for transforming the hurting world that Jesus loves. Tune: AURELIA 7.6.7.6 D ("The Church's One Foundation"). Hymns of the Spirit Three, Easter 2C, Richard E. Hurst, Universalist National Memorial Church. Psalm 118:14-29 set to Maryton (LM), Psalm 150 set to Dix (77 77 77), Psalm Settings by Dale A. Schoening, Metrical Psalms. Hymn and Song Suggestions, Easter 2, 2016, annotated suggestions from Natalie Sims, Singing from the Lectionary. Hymn and Song Suggestions, Easter 2C, 2010, annotated suggestions from Natalie Sims, Singing from the Lectionary. Worship Resource Manual, The Moravian Church, Southern Province. Worksheets for planning music in worship: hymns, anthems, solos, organ repertoire suggestions for RCL texts. Direct link to Easter 2. The Billabong, Easter 2, by Rev Jeff Shrowder, Uniting Church in Australia: Hymn suggestions and paraphrases of lectionary Psalms. Choral Anthem Project, Easter 2C, National Association of Pastoral Musicians. Sing for Joy, Easter, 2C, 2007. Choral reflections on this week's lectionary readings, St. Olaf College. Together to Celebrate, Easter 2, 2016, David MacGregor, Uniting Church in Australia. Contemporary Christian Music resources. Worshiping with Children, Easter 2C, Including children in the congregation's worship, using the Revised Common Lectionary, Carolyn C. Brown, 2016. "And Also with You," On the Chancel Steps, children's resources by Frances Woodruff, 2013. Children's Sermon, Easter 2, Faith Formation Journeys, 2013. "Marked Deck or Optical Illusion," video, John Stevens, Dollar Store Children's Sermons, 2013. Story for Children's Worship and Family Activity, Easter 2, at word-sunday.com: A Catholic Resource for the Lectionary by Larry Broding. Lectionary Puzzles, Easter 2. Word search puzzles in RTF or plain text, by Reg McMillan, St.Stephen's Presbyterian Church, Peterborough, Ontario.